An easy way to bring a little nature indoors. March 5th brought us temps at or near 80° and sunshine…beautiful sunshine. Seeing how Mother Nature chose to give Kansas City this beautiful gift, I couldn’t just stay inside and ignore it, so I stepped out on my patio to do a little crafting. All you need are a few simple supplies, dexterity and a little patience and you too can have a jar of nature next to your LCD. Pictured Above: 1. Wet floral foam, 2. Clean and empty glass jar with lid, 3. Chopsticks, 4. Odds n’ ends to decorate with, 5. Natural wood charcoal, 6. Knife, 7. Twigs and bark with lichen growth, 8. Live moss. A few notes about collecting moss and lichens, please do not break live tree branches or strip moss from the ground. It is illegal to do such in most national and state parks and is otherwise destructive to the ecosystem. Moss is beneficial as erosion control, so if you have it on your property, take care to only harvest small amounts and cover the bare ground with mulch. If you are not lucky enough to have moss growing on your property, many garden centers are now carrying it for landscaping. The moss that I used for this project was growing on shingles on my roof and was detached and blown down in a storm. The sticks with lichens were also found loose on the ground having fallen from a tree on my patio. I collected the charcoal from my wood burning fireplace. Do not use bagged charcoal for grilling, which has nasty chemicals designed to help the charcoal burn better. 1. 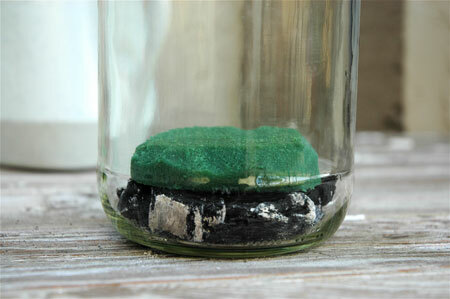 Make a layer of charcoal bits on the bottom of your jar. Blow off as much of the gray dust as you can. 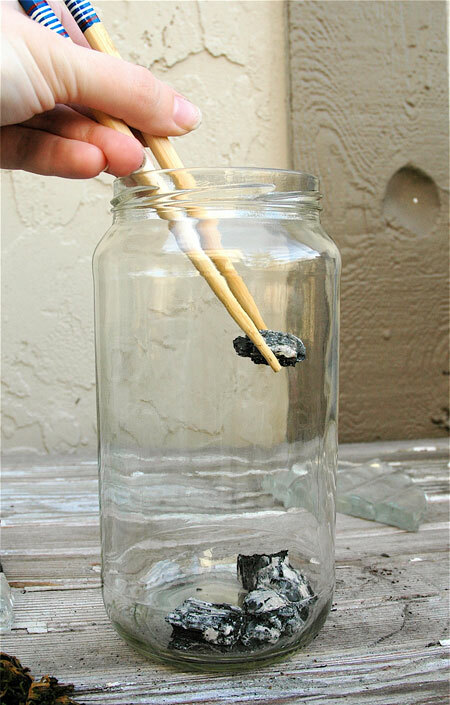 For this sized jar, use about 3/4″ of charcoal. For larger jars, use a thicker layer. The charcoal purifys the air and water in the terrarium and helps this mini ecosystem stay in balance. Chopsticks are super handy if you have big hands or the jar mouth is too narrow to fit your hand in. 2. Cut a piece of dry wet foam (Oasis) so that it is 1/2″ smaller in diameter than the inside diameter of the jar. The foam can be pretty much any height you’d like, although a good rule of thumb would be that a narrower jar have a thinner piece than a wide jar. The foam will be the base for your moss. Round off the corners down on the top of the piece so the moss will lay naturally. You will probably have to cut the foam into a couple pieces to get it in the jar. Dip the foam quickly into the water to allow it to absorb, but don’t let it soak. Position the foam in the jar on top of the charcoal. 3. Lay the moss in the jar so that it covers all of the foam. Make sure the underside of the moss is making contact with the foam. Moss is pretty rugged, so it’s ok to mash on it a bit. 4. Arrange your found bits in the jar so that it’s pleasing to you. 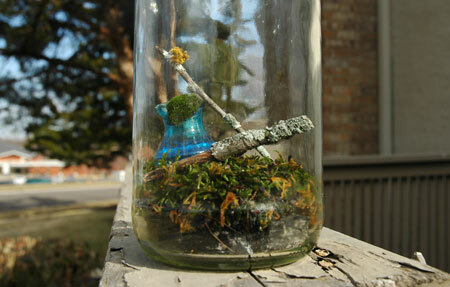 As you can see, I chose to use a couple twigs with lichens and a broken bottle with another patch of moss on top. 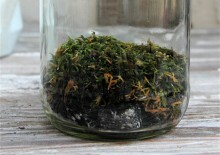 If you do want to use a small vessel with additional moss, fill the open portion of the vessel with a bit of charcoal and some damp foam so the underside of the moss won’t dry out. 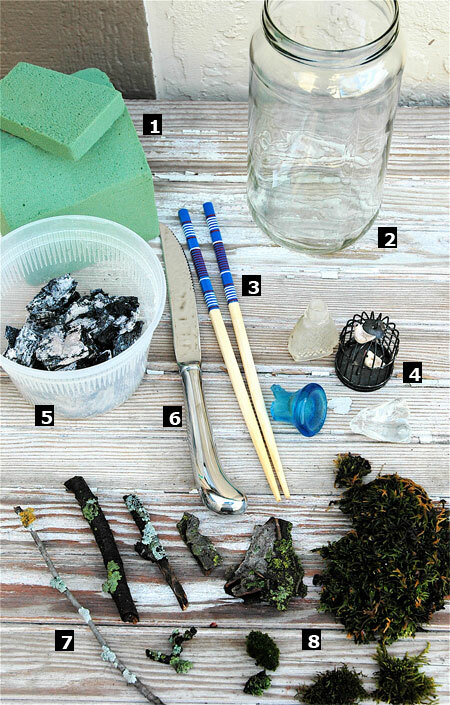 As you can tell from the picture of my supplies, I had several options for trinkets to add to my jar. I try to have a focal piece and then a couple accent bits to include. Some other options for trinkets include plastic kid’s meal toys, useless swag from tech conferences, a ceramic figurine, a rock or shell, etc. 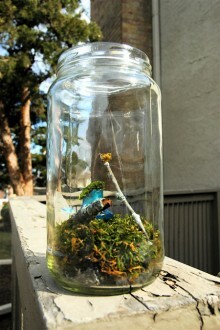 Keep in mind that what ever you place inside the jar could possibly become grown over with the green fuzzy stuff. 5. Carefully add just enough water to the jar to cover the charcoal. You can use a small watering can with a spout to make this easier. Just stream the water down the inside glass so you don’t splash or displace your arrangement. 6. 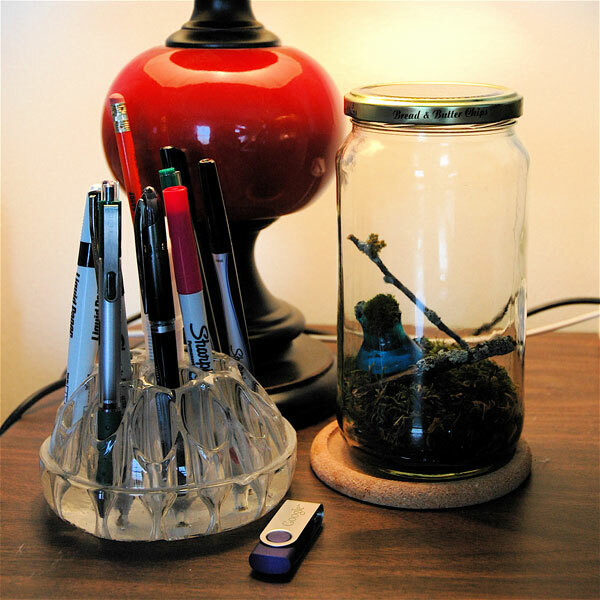 Place the lid on your jar loosely so it can “breathe” and display it on your desk. Enjoy! 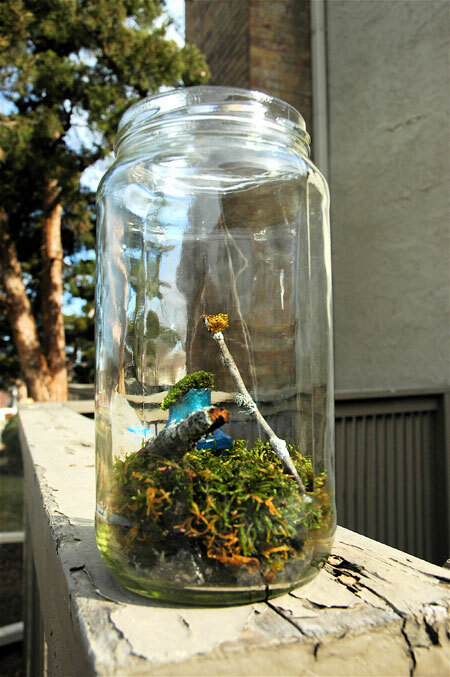 The terrarium jar needs ambient sunlight to survive. Do not place in direct sun or your jar will dry out. Think about where you found your moss…it likes cool, shady places. As you assembled your jar, you may have gotten smudges or dirt on the inside of the glass. You can clean this easily by tearing a smallish piece of paper towel and dampening it just slightly. Wrap the paper towel around your handy dandy chopstick and carefully wipe down the inside of your jar. Follow up with a dry paper towel. If the inside of your terrarium gets all fogged up and humid, crack the lid on it to allow some of the humidity to escape. The fog will disapate on its own, but if you want to speed up this process, use the paper towel on chopstick method mentioned above. Eventually, your terarium will come to a sort of equilibrium where there’s jsut enough water to keep everything happy. The glass will fog a bit when it’s warm, and then clear again. It’s like those super expensive enclosed glass ecosystem bubbles, but way cooler because you made it yourself! If you attempt this project, leave me a comment to let me know how it turned out. Or, email me a picture. I’ll post it on my site in a follow up.